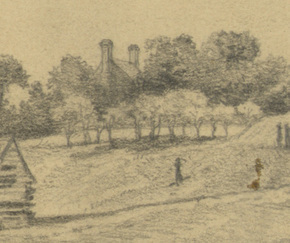 Jordan house site: "The Josiah Jordan house was known in the eighteenth and early nineteenth centuries as the estate of "Clermont," which was owned in the late eighteenth century by William Cole. The home was owned by the younger Josiah Jordan and his family at the time of its destruction in 1864 or 1865 during the Civil War siege. The site of the house is located very close to the present visitors center; a cemetery associated with the house is located in the woods near the site of Confederate Battery 6. The cemetery ("old burial ground"), the apparent location of the Jordan house ("excavation"), and three concrete foundations are shown on the 1930s NPS topographic map (NPS 1935a). The origin of these concrete foundations is not known. 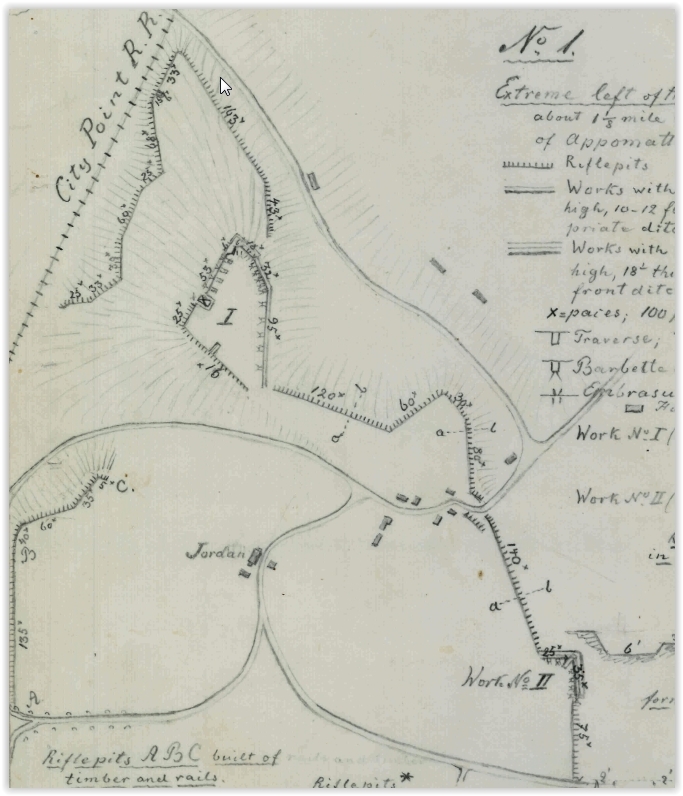 The same map indicates an early NPS entrance road from Route 36 to Confederate Battery 5. A radio transmission tower for station WPHR stood on current park property in the mid-1930s, east of the burial ground near Route 36. The subsequent construction of the visitors center and associated parking area during the 1960s obviously disrupted archaeological evidence from the eighteenth and nineteenth century plantation." From: An Archaeological Overview and Assessment of the Main Unit, Petersburg National Battlefield, Virginia, National Park Service, 2001. French Rifle Pits near the Jordan house. The Jordan farm had considerably more buildings than survived the war, as can be seen on this Federal map dated July 1, 1864 (NARA RG 77, 150-49-A).